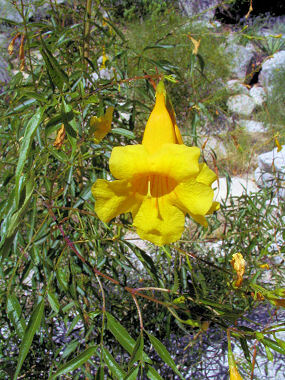 Yellow Trumpet Bush is a member of the Bignonia Family. The plant appears as a shrub and grows to 15 feet in height and has dark green, shiny, lance-shaped to oval leaves with small teeth along the edges and pointed tips that grow to 6 inches in length. The plant typically grows in dry, gravelly hillsides in southeast Arizona at elevations between 3000 - 5500 feet. Yellow Trumpet Bush is browsed by big horn sheep in the wild. It is also used as a decorative plant in landscaping. Yellow Trumpet Bush blooms between May and October and produces a bright yellow, trumpet shaped flower to 2 inches in length. Flowers are followed by a narrow seed capsule to 8 inches in length.